Celebrating this week with Ruth Ayres is a weekly ritual. Last week I missed it. So here’s to catching up with five things to celebrate this week. Find more celebrations here. ONE — My daughter passed her driving test. This means she is driving me to school, rather than the other way around. Strangely the added bonus here is time to catch up and have time with her. She appreciates the car and I appreciate the time. A good deal for both of us. 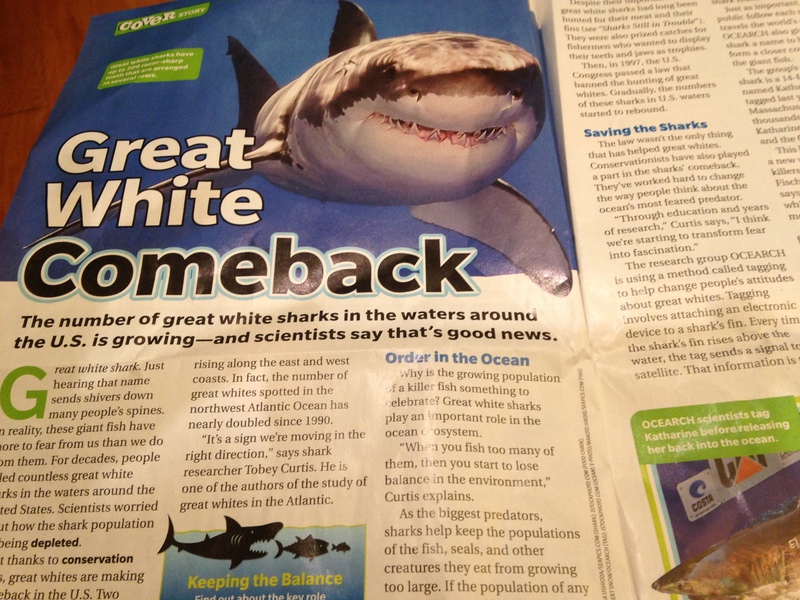 TWO — Our classroom Scholastic News magazine has finally come in and we are loving the weekly informational read. I can’t recommend this magazine enough. It does cost, but the high interest content and well designed articles adds up to perfect for informational text reading and mentor text for writing. THREE — Student blogging is a huge bonus to our writing workshop. Students reading students’ writing makes the writing real and responsive. My students have been so fortunate to connect to the classroom blogs of teachers Erin Varley, Margaret Simon and Michelle Haseltine. So much learning going on and they love it! @Mhaseltine @erinvarley @jarhartz My Ss are going to love this. They feel so famous. FOUR — Thursday Genius Hour time has become the place we work on passion projects: what we are passionate about or frustrated with. Many students are bothered by people being “mean” or “just not right.” This applies to people, animals, and their community. One boy, who is usually very social, was sitting by himself during Genius Hour time. I walked over to him and asked what he was working on. He said it really bothered him how people act better than others. “It makes me feel bad.” To fight this he came up with the “Awesome Project” or how to make people feel awesome. He’s not quite sure how to do this but I love the idea. Another group is writing a play to about bullying. Another group wants to fund a camp for kids who have challenges (they aren’t sure what challenges or how to fund it but that’s part of the process). There are groups that want to improve on Mindcraft, perhaps letters to the developer. Many thanks to Joy Kirr and her genius hour treasure trove of resources. If you have any interest in doing this kind of work, click here. Me -So tell us about your reading. S – Half and half. Me – So what’s one half? S – I half struggle and half get it. S – In Huck Finn I got it, it was good. But in Tuck Everlasting I struggled. In the end, we talked about what the struggle was specifically, how often this happens and what to do about this. Just like teaching, I’m realizing my whole positioning on parent conferences need to be reorganized in my brain: less on me telling more on me listening. Julieanne, I too am celebrating student blogging!! You have me HOOKED with Genius Hour. I want to do this. I think the research and planning will start now & we’ll start next quarter. Thanks for your inspiration!! Congrats to your daughter on her driving!! So exciting! How awesome to connect with other student bloggers! You have much to celebrate during your school day. Congrats to your daughter getting her license. Great to hear about your connecting through blogging. I guess the students are excited too with a new audience. And, bet it’s nice to be chauffeured now instead of always being the driver. Nice to hear. Have a good rest of the weekend! Connecting with other student bloggers is so important. I find my kids really pay more attention to what they write when they know someone besides me is going to read it. Love that. Student blogging seems to be catching on. I know I recommend it to teachers that come to the store as a way to get their students engaged in a different way. I also love the connections made through social media. Your week has great learning highlights. Our conferences will be in two weeks. Currently the students are writing reflections for their portfolios. Fascinating to read how they see themselves as learners. What a busy week! I love that you’re partnering with other classes to blog. And a new driver in the family is something to celebrate! My daughter has been driving me around a lot lately. Her test is next week. I am hoping all goes well. It’s such an exciting and stressful time working towards being more independent. Congrats to you and your daughter! I love the “awesome” project idea – hope you will share when it begins to come together. Also appreciate the “half and half” honesty. Kids are so great. Thanks for the update on the week. I’m intrigued by the conversation that emerged from the parent conference. I can easily imagine that this child will feel more able to take on the struggle 1/2. The fact that your conversation pushed for description rather than external evaluation must have felt really good to the student and given that student some space to relax with the “not there yet-ness” of learning. Cool beans. I so enjoyed reading your celebrations! So many wonderful things going on for you! The Genius Hour is genius! I just love this quote from your student, “I half struggle and half get it.” It’s how most of my students feel even if they can’t express it….In reality, it’s how I feel about much of the news I read too! Right there with you on the more listening part… so many amazing things have happened in my classroom since I have tried to SHUT my mouth more and open my ears to what students are saying. The down side is it takes so much energy to listen. Of course it is worth it, but I am completely wiped at the end of the day. My college students commented on kids’ blogs this week through #comments4kids–they loved seeing what kids were doing. I think it’s so important for students to be blogging–learning, sharing, connecting. Love what you say about listening–and I appreciate that reminder. So many more good things happen in my classroom when I’m quiet!